The Ultimate physios are back! 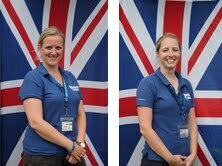 It is awesome to have Angela and Laura back on the show; they are part of the outstanding medical team that supports GB Ultimate and the UK domestic tournaments. Check out episode 7 to hear more about them and the some great advice for Ultimate players of all levels from these two very experienced sports physios. In this show we talk through a typical weekend tournament and the best things to be doing to maximise your performance, reduce injury risk and generally keep yourself going. Starting a few days before the tournament and then go through every stage of a typical tournament (including the journey, arriving, sleeping, first game and between games) and then finish up a day or say after you get home. At each stage we discuss the best strategies and things to think about to enusre you are at your best when you need to be. ----more---- This podcast ends with the song These Times (Live @ KEXP) by Stag, available under a Creative Commons Attribution-Noncommercial license.